The location is fantastic. Bed very comfy. The retro style. The nice rooms. Basically everything! A great find - a tiny, quirky apartment in about as central a location as you can get. Clean, well-presented and pretty comfortable considering its size. Elise was flexible re arrival time and very helpful. Super easy. Door sticks but honestly this place is incredible. Everything about it. It's kitch, cosy, cool and in an amazing location. Such a unique little place in the heart of lively London yet perfectly quiet and homely! The host Elise was in full contact from before we arrived till we left and was super helpful. Everything..compact, quirky, warm and interesting, and a great location with a very helpful owner. Lock in a great price for Soho Stables - rated 9.7 by recent guests. Soho Stables offers self-catering accommodation in Soho, London. This apartment is 200 yards from Piccadilly Circus. Free WiFi is provided throughout the property. This 200 year old converted stable is split on 2 floors and comes with a fully fitted kitchen and a bathroom with a shower, heated towel rail and complimentary natural toiletries. The bedroom features a platform bed accessed by a vertical ladder, skylights, a French balcony, TV, sofa and chairs. Guests will find a range of cafes, restaurants, bars, clubs and theatres in the neighbouring streets to Soho Stables. Piccadilly Circus underground station is 250 yards from Soho Stables. London City Airport is 8.1 miles from the property. 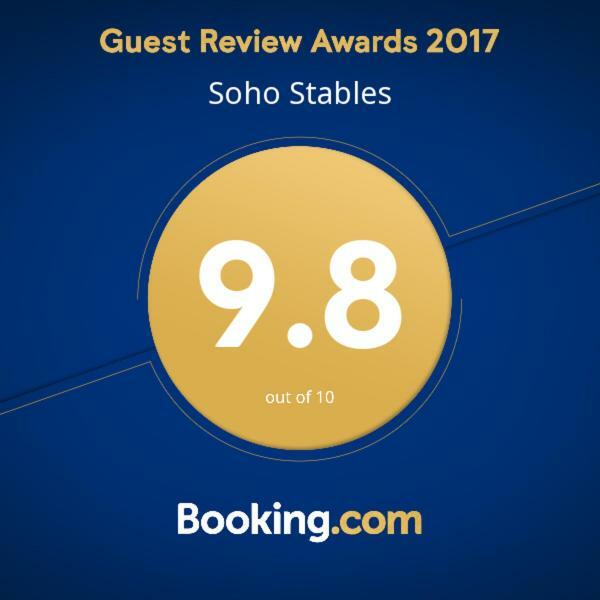 Soho Stables has been welcoming Booking.com guests since 8 Feb 2017. When would you like to stay at Soho Stables? Apartment comes with air conditioning, a fully fitted kitchen including a fridge, electric hob, microwave, washer dryer, coffee machine, kettle, complementary tea, coffee and sugar and vintage dining table and chairs. The bathroom has a shower, heated towel rail and complimentary natural toiletries. The bedroom is fitted with a platform bed accessed by a vertical ladder, skylights, a French balcony, TV, sofa and chairs. Soho stables was a labour of Love for me and my husband. Everything in it has been carefully planned and chosen, down to the smallest cactus! I think you will love the individuality of Soho stables and I can promise you, there is no where like this in London. And of course, the location is virtually impossible to beat. So if you are on business, on holiday or just wanting a unique get away then Soho stables is perfect for you! Myself and my family live in London and we know it well. We will be happy to advise you on where to go, what to see and basics like transport - so just ask me! Soho is an amazing village community in the very heart of London. It has been very popular for travellers for hundreds of years and today, you are guaranteed to be wowed by it. During the day you will find hundreds of boutiques, cafes and bars all with their own unique style and perhaps you can sit outside, sip a coffee and watch the world go by. Night time, Soho becomes an animated creature where you can be seduced by the clubs, restaurants, cabaret shows and general vibe of the place. Then come home to Soho stables and fall asleep in a cosy quiet bubble of calm. House rules Soho Stables takes special requests - add in the next step! Booking.com takes your payment on behalf of the property for this reservation. During your stay you can pay for any extras using American Express, ​Visa, ​Euro/Mastercard and Maestro . Please note the bed is a sleeping platform accessed by a vertical ladder. It may not be suitable for people with limited mobility. Please note that this property does not have a reception. Guests are required to contact the property prior to arrival to arrange a check-in time. Please inform Soho Stables in advance of your expected arrival time. You can use the Special Requests box when booking, or contact the property directly with the contact details provided in your confirmation. The bed - actually very comfortable - is some 8 feet off the ground, accessed via a vertical ladder. I should have thought a bit more about this before drinking several G&Ts...! Things may perhaps get a little tight in the bathroom, but that was fully expected given the unique space and the thoughtful way it has been renovated (more space devoted to living and sleeping areas, whilst retaining a very useable kitchen and dining area too). Wonderfully warm welcome, however there IS a secure key box for those that prefer to arrive without interaction. The dimmable lights and very comfy pillows were much appreciated after a few days of poor sleep elsewhere. There are plenty of USB power ports built into the wall sockets, even at the bedside and the kitchen countertop; a small thing but useful and unexpected, as was the DAB radio. For those concerned about the compactness of the apartment: the living and sleeping area feels spacious and airy thanks to the sizeable Velux roof windows (with blackout blinds), the little French balcon and the lofty vaulted ceiling. It does not fit bigger size people. If you are over 100 kg do not think of booking here. Also you have to climb to go to bed ( cool but somehow hard). It feels like home. Staff are very helpful but I already mentioned that i will be arriving early morning, no body red that. So i had to wait for 5 hours to be apple of checking in. Fantastic venue in the heart of Soho. Very quiet, very very comfortable and definitely unique! What’s not to like about this place? A beautiful home, a generous host, close to everything. Best place I’ve ever stayed in London!